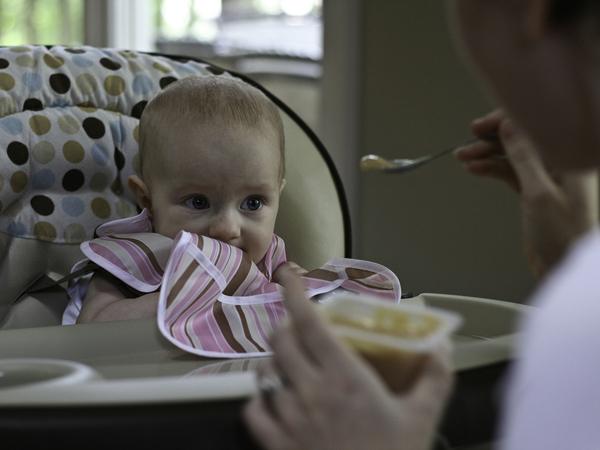 New parents often worry about so many things, especially feeding a baby or toddler. Our parenting blogger Meg Faure shares her top five tips to help you relax about food issues. Feeding a baby and toddler, in my opinion, is one of the toughest aspects of parenting! It’s tough because weight gain can feel like the only measurable thing you have as a mom and while it appears to be the one thing you can control, it’s actually the one thing you can’t control. So because it is a fraught with anxiety and emotion, these are my top five tips on feeding your baby and toddler. Your baby’s growth chart is a guideline, not a goal. What we do know is that babies should gain weight from one weigh to the next. Do not weigh weekly, unless your baby was premature or ill or there is already cause for concern. The only time you need to see your doctor is if your baby loses weight or if her height and weigh proportion changes markedly. If your baby’s growth line changes suddenly, you can also bring it to your doctor’s attention. In a nutshell, if your baby is gaining weight, is happy and sleeping well and produces 8-10 wet nappies a day – you are probably doing a great job feeding him or her. Almost every mom experiences guilt related to what she or her baby has eaten. It starts in pregnancy when you feel guilty about that one cup of coffee or the sushi you could not resist. The breast/bottle debate is one seriously thorny arena and. of course, introducing solids is a minefield of unparalleled proportions. The best solution is to ditch the ideal – do your best and do the rest in love. I hate eating alone – do you? So why do we expect our toddlers to guzzle a bland blend of peas and carrots with an audience and no mates at the table? Join your toddler in social eating – at least once a week have family dinner and eat with your toddler, chatting and having fun. Mealtimes are best when social. Healthy food is a wonderful gift because it instills healthy choices for life. In principle, no salt, low sugar and zero junk food should be the goal. Make your baby’s food yourself and when you can’t, choose wholesome prepared meals rather than fast food. For more healthy eating tips book your slot at Meg’s Baby Essentials workshop – call 021-462-1508.